and my 3 AMAZING nieces and 1 AMAZING nephew!! What a nice post to your sister in law! I envy that you have a good relationship with your sister in law. I don't have one with my sister in law. That's a long story. Thank you Alisa! You and your family have been a HUGE blessing to me & the kids during this time. Each day is a new one...I keep reminding myself of that. And I know with the Lord's guidance, somehow, we'll be ok. Thank you so much! What a lovely relationship you have with your sister in law, I'm blessed and have one with my siblings and sister in law wishing whatever is the issue will be resolved quickly. Prayers for your SIL! I DON'T KNOW what I would do without mine! Now a proud new Google Friend follower! 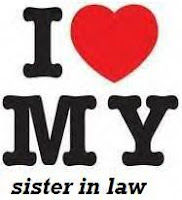 BTW, may I please use your I heart my SIL picture on my blog?